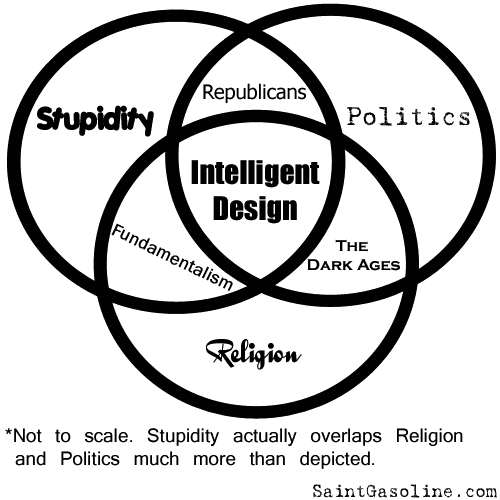 here's a Venn diagram showing how stupidity, politics, and religion overlap. The funny thing is, I already had blog tags for all 3. That seems to portray all religions in a bad light, which isn't right. There are several fine religions, such as Buddhism, Atheism, and Satanism. Also, Democrats, Liberatarians, and Green Party should be included in with Republicans. @ Vid: Atheism is not a religion. It's the absence of one. It's like trying to say bald is a valid hair color. But anyway, you're right. It should be Christianity in that circle instead of Religion. I didn't make the Venn Diagram, though. As far as the other political parties, no one said this diagram was exhaustive. I would have to agree to disagree with you there. I suppose it just varies from atheist to atheist whether they consider it to be no religion, or a godless religion.